24 years old Avani Chaturvedi has written a new chapter of women empowerment by becoming India’s first fighter pilot. Avani Chaturvedi hails from Rewa district in Madhya Pradesh. She did her schooling from hindi medium school. Swami Vivekanand’s preachings has great effect on Avani’s personality. She reads Geeta regularly and meditate daily for better concentration and close attention. Avani’s elder brother is an army officer. 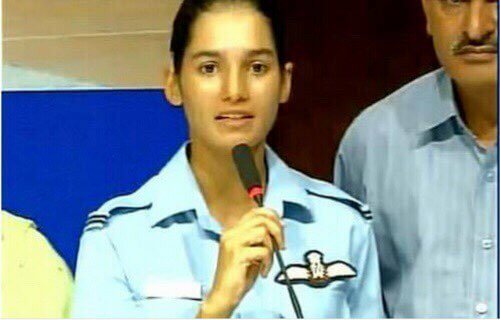 She was inspired by him and Astronaut Kalpana Chawla to join Indian Air Force. Avani completed her B.Tech in computer science and electronics with 89% marks. She cleard Air Force combined admission test in 2014 and got selected after cleaning aptitude battery test. By flying MiG 21 ‘Bison’ which has highest landing and take off speed in the world , Avani gave direct impression of female power. Avani gave perfect reply to those who think women couldn’t be a fighter pilot . She is a living example for all the women of our country. Avani said one needs to be technically skilled to fly MIG 21 ‘Bison’. Muscle power has nothing to do with this. Avani wants to become such a good fighter so that her senior could trust her in crises. She is truly an inspiration to all of us.